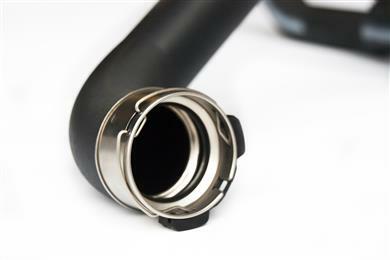 Royal DSM, a global science-based company active in health, nutrition and materials, has developed a new high temperature resistant grade of its Arnitel® thermoplastic copolyester elastomer (TPC) for production of flexible hot charge air ducts used in turbocharged engines. Arnitel HT will allow system suppliers to produce the ducts in a single material and using a single process step. The current standard practice is to assemble separate elements in hard thermoplastics or metal and soft thermosetting rubbers, which need to be produced in diverse operations. Switching to Arnitel HT will provide producers with a significant improvement in process efficiency, cost reductions of up to 50% and weight reduction of up to 40%. Hot charge air ducts are common features in advanced petrol and diesel engines. They transfer hot compressed air from the turbocharger or the supercharger to the intercooler in a system that increases the efficiency of the engine by using higher operating pressures. The ducts obviously need to withstand very high temperatures for long periods; furthermore, in order to handle movements of the engine relative to the cooler (which is fixed on the chassis of the car) and because they need to be easy to install, flexibility is an important requirement. These needs are normally met by using ducts with a central section in a rigid high temperature thermoplastic such as DSM’s Stanyl® or Akulon® polyamide, and end sections in a thermosetting polyacrylate, ethylene acrylic or fluoro rubber with a woven reinforcement. There are several disadvantages associated with this approach, the two most important of which are weight and cost. Assemblies based on these thermoset rubbers are heavy, because their relatively low mechanical performance dictates the need for thick walls to be able to handle the demands of the hot charge air duct. In addition, total system costs of rubber-plastics (or metal)-rubber solutions can be quite high, for various reasons. The production process is a multi-step one: molding of the various elements, followed by assembly; this adds costs and takes extra time, and it also introduces extra opportunities for defects to be introduced, both during production and in use. Because rubber processing and plastics processing require different skills, companies producing the ducts may even buy some sections rather than make them themselves. In addition, to reduce the risk of failure due to creep at the joints in these assemblies, reinforcement rings are placed inside the tubes, another assembly step. Also not to be overlooked is the environmental disadvantage. Rubber is not easy to recycle, while energy consumption during processing as well as the working environment for operators leave a lot to be desired in terms of sustainability. Arnitel HT eliminates all these disadvantages. With its ability to withstand continuous operating temperatures of up to 180°C and peaks of up to 190°C, it has high temperature resistance unequalled among thermoplastic elastomers. Arnitel HT also has good resistance to the sorts of oils and chemicals found in automobile engine environments. Critically, Arnitel HT’s combination of elasticity with high mechanical strength means that it can be used to produce the entire duct in a single piece, using 3D suction blow molding. Wall thicknesses can be approximately halved. DSM has been able to build on previous successes in improving the long-term thermal stability of Arnitel. Other grades have already proven themselves in existing duct applications requiring good heat resistance. One of the first producers of hot charge air ducts to take advantage of this new innovation is CIKAUTXO, headquartered in Spain, which has capability in production of rubber components and also in plastics blow molding and injection molding. The company worked together with DSM on the development of the first part in Arnitel HT, and exchanged valuable information for improvements in the material, processing, and part validation. 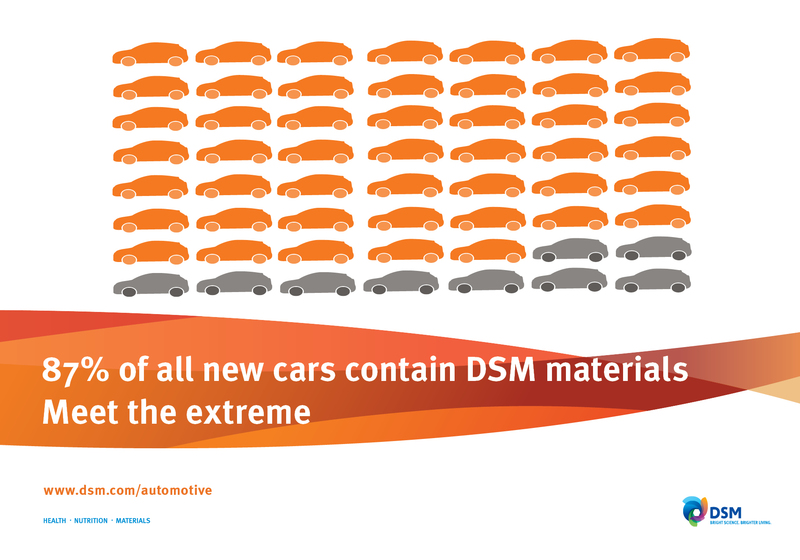 DSM offers high-performing plastic solutions, technologies and expertise for the extreme demands of next-generation vehicles. These materials are a driving force in lightweighting, downsizing and e-mobility. On the road to zero emissions it’s time to think differently. To think beyond metal. Think together with DSM - visit www.dsm.com/extreme. New high temperature resistant Arnitel TPE from DSM replaces plastics-rubber and metal-rubber combinations in hot air ducts. 87% of all new cars contain DSM materials. Significant improvement in process efficiency. Cost reductions of up to 50%. Weight reduction of up to 40%. Arnitel HT will allow system suppliers to produce the ducts in a single material and using a single process step. The current standard practice is to assemble separate elements in hard thermoplastics or metal and soft thermosetting rubbers, which need to be produced in diverse operations. Switching to Arnitel HT will provide producers with a significant improvement in process efficiency and cost reductions of up to 50%. Assemblies based on these thermoset rubbers are heavy, because their relatively low mechanical performance dictates the need for thick walls. The production process is a multi-step one: molding of the various elements, followed by assembly; this adds costs and takes extra time, and it also introduces extra opportunities for defects to be introduced, both during production and in use. With Arnitel HT you reduce the risk of leakage, you save weight and you are more cost-effective. So contact us today to learn more.